Happy Friday, everyone! 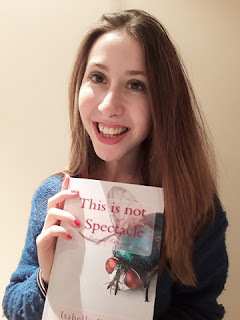 Today is the last day of my blog's first Independent Author Week! I had so much fun interviewing some cool authors, and I'll look forward to hosting another one of these in the future. Today, I'm interviewing Isabelle Kenyon, a poet from the UK. She has a few poetry collections, chapbooks, and anthologies out now! I write poetry mostly. I find that although I dabble in playwriting and short stories, poetry is the form which comes most naturally to me! My poetry explores human nature because I have such a fascination with people . My debut collection, This is not a Spectacle, is available on Amazon. It's a really exciting collection because it is the first time I have shared my work. I would describe it as both feminist and personal! 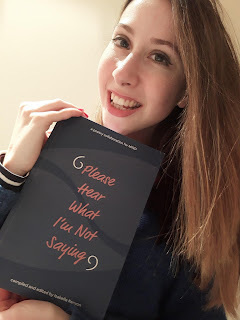 I also have an anthology out for UK mental heath charity Mind which is called Please Hear What I'm not Saying. It's available on Amazon and the profits go to a great charity. I have edited this book and collated 116 poets so it has been a fantastic project. Tell me about your upcoming books--what's coming out next? I'm looking forward to the release of my new chapbook with Clare Songbirds Publishing House in New York. The chapbook is called Digging Holes To Another Continent and is available to pre-order on their website. It's a collection about the most amazing trip to New Zealand and my lovely family and how we are perfectly dysfunctional. Tell me about your writing process! How do you come up with your ideas? Sometimes I put pen straight to paper because my writing at that moment is purely driven by emotion. If I want to write about a certain subject I will do some brain storming first and maybe look at some art themed around it! Perfecting and editing by saying it out loud! Hearing how others interpret the poems as well. Haha you'll live through it! Trust your gut. I've been writing poetry solidly for about seven years. My Granny Olga, who was an amazing poet, first inspired me to write. I'm inspired by people around me or by things which make me stop and think. I have a wandering imagination! Sometimes I find a walk helps. It sounds cheesy but nature is inspiring and a bit of silence and reflection goes a long way. I'm working on finding a home for a collection about growing up and all the awkward emotions that brings with it! I think I'm not quite done writing on that subject. I have a lot of awkward feelings to put down on paper clearly! Thank you to Isabelle for participating in Independent Author Week! The next author on this blog will be Chelsea Lauren, so be on the lookout for that post later this week!